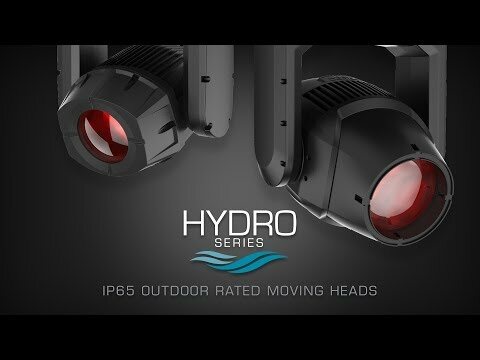 The ADJ Hydro Beam X1 is an IP65 rated professional moving head fixture with a 100W Osram Sirius HRI, 6,000 hours, discharge lamp that produces a razor sharp 3-degree beam. Its compact sizes offers quick movement. With robust construction and IP65-ratings, the Hydro Beam FX1 is designed for both indoor or outdoor use. Its durable casing protects it from dust, sand, moisture, and liquids, making it ideal for use in all situations from dusty deserts in California to rainy fields in England. Perfect for festivals and outdoor events, as well as installation in open-air clubs and other outside entertainment spaces, this groundbreaking fixture offers an extended operational life and reduced maintenance requirement due to their sealed casing design. The Hydro Beam FX1 has several high-performance features such 16-facet circular prism with overlay and an independent frost filter for wash effects. Its fitted with 3-pin DMX In/Out and powerCON In/Out connections. It offers a USB port for software updates. All connections are IP65 rated with rubber protective covers.